Where we teach YOU to be the artist! DIY walk in arts and crafts studio in Central Minnesota. Art As You Like It, in Waite Park MN, is located near the Crossroads Mall in the St. Cloud area. We have been serving the Central Minnesota area as a walk-in, Do it Yourself arts studio since 2003! Our most popular creative area is paint it your self pottery painting. But we have so much more! We offer walk in instruction for pottery painting, glass fusing, canvas painting wood signs or clay fired art. Public and private classes are available. Check out our website for more information. Some items need to be fired in our on-sight kiln. We do have make and take options. 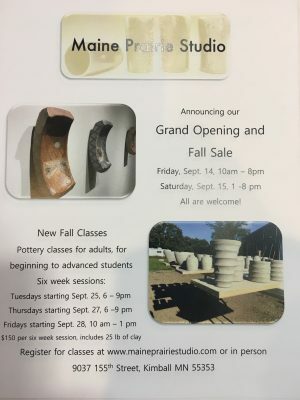 Maine Prairie Studio is the pottery studio and home of Megan Mitchell and JD Jorgenson, based in rural Minnesota. We offer classes, workshops, experiential leaning opportunities, sales, and welcome visitors other times too! 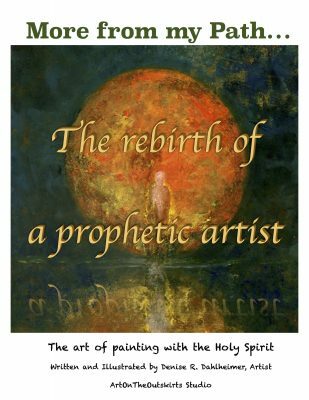 Riverside Art Studio offers introduction and advanced classes in Oil Painting, Drawing , Sculpting, Plein Air, Watercolor, Pastel, Professional Art Development for Art Teachers and Instructors, and College Portfolio Development. SAS is a new store that exclusively sells products made by college students and products brought to the United States through student lead efforts. Items include one of a kind jewelry, pottery, photography, paintings, cutting boards, greeting cards, candles, weavings, publications, knitted items and more! Come support up and coming student artists and get unique, beautiful artwork for a reasonable price. The Artist Bindery is a 3,000 sq ft art space embedded in an east side warehouse in St. Cloud, MN. The studio is a place for intercultural experimental work and exhibition space for artists and community members. THE ORIGINALS GROUP began as a group of (9) art students who study artists and their mediums. THE ORIGINALS illustrate original children’s books to bring attention to the needs of local, national and international charitable orgainizations. Our Statement Artists United by Universal Concepts is a group of creative and socially conscious people, sharing artwork that focuses on the environment. Each artist has their own unique way of expressing their concern about the relevance of continuing to protect and safeguard our natural resources. We are a group of people coming from diverse backgrounds, connected by our interest in the future of this planet. Despite the many technical advances that have taken place in the last 100 years, we still have not addressed crucial life-threatening issues that affect not only the environment, but the world as we know it today. We can no longer think in terms of divided countries, but as a global community that needs to come together to protect and promote the well-being of our only source of survival — the living earth. Our Goals Our goals are to present exhibits, both real world and online, to raise awareness of environmental issues and our art. Whitby Gallery and Gift Shop at Saint Benedict’s Monastery.